Sutton Valence Castle is a Norman stone keep and bailey fortress, founded by Baldwin de Béthune, count of Albermarle. Standing against an escarpment, are the broken ragstone walls of a small 12th century two storey keep, with a square forebuilding. The castle was abandoned in the 14th century and now there are only glimpses of the bailey curtain wall, tracking the ridge. 4 miles north-east is Leeds Castle. 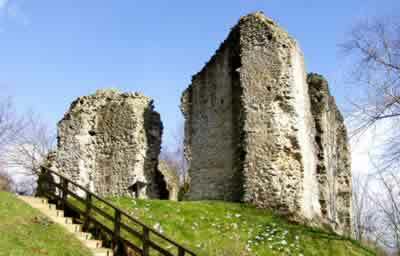 Sutton Valence Castle is located in the village centre, off Rectory Lane. 7 miles south-east of Maidstone, on the A229-A274.